1840 His Emperor Highness Mykola I signed the Highest Rescript about opening the medical faculty at St. Volodymyr University (29.04 in the old style). 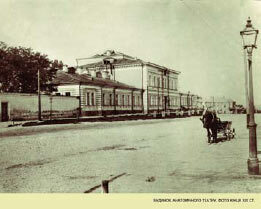 1841 Council of St. Volodymyr University approved the decision about opening the 1st medical faculty in September 1841. First admission – 29 students. On 23 (9), September, professor M.I. Kozlov read the first lecture on anatomy, and on 26 (12), September, professor V.O. 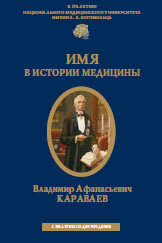 Karavayev – first lecture on encyclopedia and methodology of medicine. 1881 The student’s scientific society “Clinical society of students-doctors” was organized. The organizer of the society was A. Kysil, who later became a famous pediatrist and public leader. 1920 Kyiv Institute of Health Care, which united the medical faculty of St. Volodymyr University, Women’s Medical Institute, medical faculty of Ukrainian state university, was established. 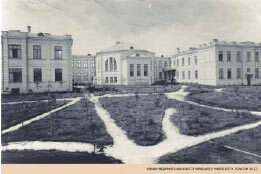 The odontologic university, later transformed into the faculty with the same name, was included into it in October 1920. 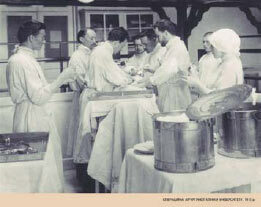 1930 the newspaper “Red doctors, which in 1936 was renamed into “Medical cadres”, was established. 1941 when the Great Patriotic War started the institute was evacuated to c. Kharkiv and later to Chelyabinsk. 1946 Kyiv Medical Institute was given with the name of the President of Academy of Sciences of UkrSSR O.O. Bogomolets. 1965 The historical museum of medicine was organized on the basis of the institute (since 1982 – National museum of medicine of Ukraine). 1992 The institute was reorganized into Ukrainian O.O. Bogomolets state medical university. 1995 By the Decree from the President of Ukraine the university received the status of O.O. Bogomolets National medical university. 2005 Establishment of Eastern European network of universities, which includes 35 higher schools from 7 countries, under the aegis of the University in order to intensify the international cooperation, directed to realization of Bologna declaration’s principles. 2009 Famous lecture by laureate of Nobel Prize, academician Yevgen Chazov, who was awarded with the title of Honorary doctor of medicine at University. Modern lecture hall No 3, named after V.F. Voyno-Yasenetskyy, which became the winner at International contests among CIS countries “Prointegration awards 2010”, was opened. The contingent of persons that study at the University has increased to 10 ths. people. The special training program for doctors at the expense of Kyiv regional state administration was launched for the first time among higher medical schools of Ukraine. 2011 President of Ukraine Victor Fedorovich Yanukovich and Metropolitan of Kyiv and all Ukraine, Primate of Ukrainian Orthodox Church VOLODYMYR congratulated the graduates from the University. 1842 Doctor of medicine О.P. Walter, professor, one of founders and heads at department of anatomy (1844-1868) was the first who proved scientifically the influence of sympathetic nerves on the blood vessels’ tone. 1846 Professor V.O. 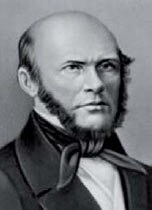 Karavayev, founder and first dean at medical faculty (1843-1847) made the pericardiocentesis for the first time in Russia. 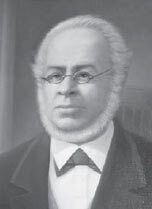 1847 Professor V.O. 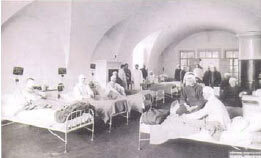 Karavaev made the depression through cornea incision; was the first after M.I. Pyrogov who used ether narcosis. 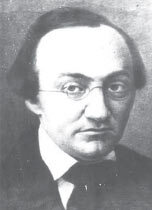 1853 Professor О .P. Matveyev, organizer and first head at department of obstetrics, women’s and children’s diseases (1844-1882), dean of medical faculty (1862-1865), rector of Kyiv St. Volodymyr University (1865-1872, 1875-1878) suggested the method for blennorrhea neonatorum prevention (putting in eyes the drops of 2% silver nitrate solution). 1861 Professor O.P. Walter established weekly “Modern Medicine” – first periodical scientific medical edition in c. Kyiv, at the Anatomical theater of the university. 1863 Professor U.К .Shymanovsky, ordinary professor on operative and military surgery, companion of M.I. Pyrogov, one of founders for plastic surgery, worked out in details a surgery of osteoplastic amputation of thigh (the Gritti-Shymanovsky amputation). 1870 Doctor of Medicine О .S. Yatsenko, assistant professor at department of surgery, was the first in Russia who made skin transplantation in order to remove a skin defect caused by a gunshot wound. 1874 Professor V.О. Betz, head at department of anatomy (1868-1890), pupil of O.P. Walter, described the giant cells of brain cortex (world-known as Betz cells), his unique collection of brain specimens (8,000 units) was honored in Vienna at World exhibition (1873). 1874 Professor G.М .Minkh, head at department of pathological anatomy (1876-1895), performing an experiment on him, proved infectiousness of the blood of the patients, suffering from relapsing fever. 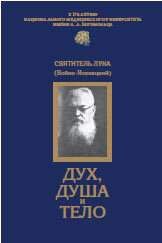 1875 Doctor of Medicine F.О. Lesh, founder and head at department of medical diagnostics with propedeutic clinic (1885-1897), founder of coprology, for the first time in the world discovered and described agents of amebiasis, described lambliasis, balantidiasis. 1877 Professor S.P. Кolomnin, head at department of theoretical surgery with hospital surgery clinic (1872-1878), was the first one in the world who made intra-arterial transfusion of defibrinated blood in the field. 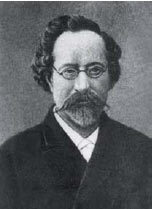 1878 Professor P.І. Peremezhko, founder and first head at department of histology, embryology and comparative anatomy (1868-1890), dean at medical faculty (1872-1875), discovered and described indirect division of animal cells (mitosis). 1886 Doctor of Medicine V.К .Vysokovych, honorary ordinary professor (1895), head at department of pathological anatomy (1895-1912), was the first one to discover ability of some connective tissue cells to capture the microbes that were inserted in blood. It formed the basis of the scientist’s doctrine on reticuloendothelial system. 1887 Doctor of Medicine V.P. 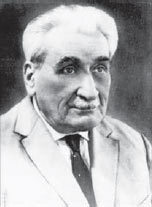 Obraztsov, head at department of special pathology and therapy (1893-1903), one of founders for Kyiv therapeutic school, worked out the diagnostic methodology on deep sliding methodic palpation of abdominal cavity organs. 1895 Professor О.D. Pavlovskyy, head at department of surgical pathology and therapy (1889-1912), was the first in Russia who prepared and used antidiphtheritic serum, established the first in Russia Pasteur station, in 1896 – Bacteriological institute, was its first director (until 1909). 1896 Doctor of Medicine V. U. Chagovets, later – head at department of physiology (1910-1935) offered ionic theory on origin of bioelectric potentials in living tissues, established the condensing theory of tissues irritation. 1904 Professor Ye.G. Chernyakhivskyy, first director at Kyiv medical institute (1920-1921), for the first time in Kyiv took in the heart wound with successful result; one from the first national surgeons used the craniotrypsis at purulent cerebral meningitis. 1909 Professor V.P. Obraztsov and his pupil M.D. Strazhesko were the first who gave the clinical description for thrombosis of coronary arteries of heart and explained the possibility for the life-time diagnosis of myocardial infarction. 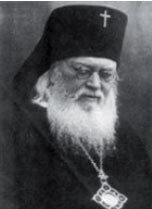 1912 Professor І .О. Sikorsky, head at department of psychiatry (1903-1918), founder of children’s psychology and children’s psychiatry, established the Child Psychology Institute in Kyiv that was the first one in the world and became its director. 1912 Professor O.F. Shymanovskyy for the first time made the clinical transplantation for the front part of eye apple. 1924 Professor О.V. Коrchak- Chepurkivsky, founder and first head at department of general and social hygiene (1918-1923), studied the level of health and demographic characteristics of population in Ukraine, development of nomenclature of diseases in Ukrainian language, table of mortality and duration of life for population in UkrSSR (1927). 1935 Professor V. U. Chagovets developed and put electrogastrography into practice. 1935 Professor М. D. Strazhesko and his pupil V. H. Vasylenko, in future – famous scientists – therapeutist – gastroenterologist, founder of all-Union scientific research institute on gastroenterology at MHC USSR, worked out a pathogenetic substantiated classification of blood circulation deficiency. 1938 Professor O.G. Chernyakhivskyy, head at department of histology and embryology (1924-1929) for the first time in the world described receptor endings on cancer epithelial tissue. 1949 Professor O.I. Cherkes, head at department of pharmacology (1944-1971), established the doctrine on trophic action of cardiac glycosides, one from the first in the world launched the researches on biochemical pharmacology, pharmacokinetics, pharmacotherapy, developed new cardiovascular drugs (cardiotonic, antihypertensive, antianginal, hypolipidemic agents), neurotropic agents (ganglionic blockers, adrenoceptor agonists and adrenoceptor antagonists), antituberculous drugs. 1951 Professor V.M. 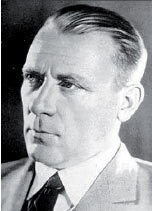 Ivanov, head at department of therapy in sanitary hygienic faculty (1944-1951) offered the method on fluorographic planigraphy of lungs for early diagnostics of lungs cancer and other pulmonary pathology (tuberculosis, pneumonia, abscess, pleuritis, was awarded with State Prize of USSR in the sphere of science and technology. 1953 Professor S.N. Weisblatt, head at department of surgical stomatology (1932-1953), for the first time in national surgical stomatology implemented the anaesthetization, including new method on conduction anesthetization in surgery of dentofacial and adjoining regions. 1958 Academician L.V. 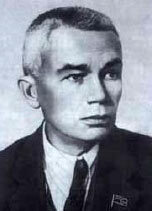 Gromashevskyy, head at department of epidemiology (1948-1962), explained and developed the theory of epidemic process, formulated the laws of epidemiology, which founded highly efficient principles on struggle against infectious diseases, determined the criteria for liquidation of infections. 1960 Academician Ye.G. Goncharuk, head at department of municipal hygiene and ecology of human (1968-2004), rector (1984-2003), explained the scientific approach to underground methods on waste water purification, which founded the principally new schemes and types of treatment facilities, being developed and implemented by him, further he established the theory, methodology and principle scheme on hygienic regulation of exogenous chemical substances in soil, described the mechanism on origin of intoxication at agricultural fields, processed with pesticides, developed the model on research for toxicity of chemical substances within the system “mother-fetus-newborn”, researched the peculiarities for united action of radio nuclides, pesticides and heavy metals salts on human health. 1962 Professor Ye.F. Shamray, head at department of biochemistry (1955-1976), acting director of the Institute (1955-1956), established the medicine “galascorbinum” and described its chemical, biological and therapeutic properties. 1963 Professor O.M. Khokhol, head at department on Propedeutics of children’s diseases (1946-1950), hospital pediatrics (1950-1964), established and implemented the practice on feeding children of young age with cow’s milk with calcium content reduced by ion-exchange resins, she received the Golden medal of VDNKh UrkSSR for that discovery; the department of hospital pediatrics (1964) was awarded with her name, now department of pediatrics No 2. 1965 Professor O.A. Grando, head at department of social hygiene and organization of health care (1972-1990), established the historical museum of medicine, using modern principles of museum science and technology. The historical museum of medicine, which in 1986 joined to European association for historical museums of medical sciences, was opened on the base of this museum in 1982. It was awarded with State Prize of Ukraine in the sphere of science and technology. 1968 Professor M.P. 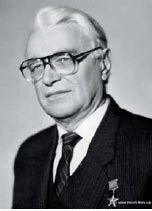 Cherenko, head at department of general surgery (1980-1984), for the first time in USSR applied the radioactive iodine to treat the patients, who suffered from Basedow’s goiter. 1972 Professor M.F. Danylevskyy, head at department of therapeutic stomatology (1968-1990), explained the use of proteolytic enzymes by animal and microbial origin in stomatological practice, awarded with State Prize of UkrSSR in the sphere of science and technology. 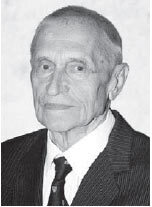 1980 Professor P.M. Gudzenko, head at department of faculty pediatrics (1965-1982), explained and developed the methods on application of cultured milk foods in feeding the children at tuberculosis and staphylococcosis. 1985 Academician Ye.I. Chazov, graduate from University in 1953, was awarded with Noble Prize for peace. 1985 Academician P.D. Fomin, head at department of surgery No 3, developed and implemented the methods of operative interferences at acute bleeding gastroduodenal ulcers. 1985 Professor V.S. Zemskov, head at department of surgery in pediatric faculty (1980-1982), general surgery (1982-2002), established and implemented the methods of hypothermia in treatment of hepatopathy, bile-excreting tract and abdominal salivary gland into clinical practice. 1990 Professor M.P. 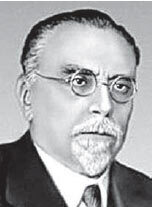 Zakharash, head at department of surgery No 1, developed the surgical doctrine on treatment of malignant tumors and other diseases of abdominal cavity organs under of the conditions of chronic effect from small doses of radiation. 1991 Professors A.M. Politun, M.F. Danilevskyy, I.P. Gorzovyy (department of therapeutic stomatology) established and implemented the interstate (Ukraine – Switzerland – Russia) preventive system on caries and parodontosis within biogeochemical deficit of fluorine and iodine. 1997 Professor O.K. Napreyeynko, head at department of psychiatry and addictology, launched the ecological psychiatry as the new scientific practical direction in psychiatry. 1997 Academician V.P. Shyrobokov, head at department of microbiology, virology and immunology, for the first time discovered the event of genetic disassociation of enteric viruses, found out the peculiarities in biological properties of their selective variants, explained the perspective to use some of them as live vaccines. 1998 The collective of scientists-hygienists, headed by academician Ye.G. Goncharuk (V.G. Bardov, S.I. Garkavyy, Yu.V. Voronenko, Yu.I. Kundiyev, I.I. Nickberg, G.I. Sydorenko, V.I. Tsypriyan, O.P. Yavorovskyy) for the first time in history of national higher medical education was awarded with State Prize of Ukraine for the best textbook “General hygiene: Propedeutics of hygiene”. 2000 Professor M.I. Tutchenko, head at department of surgery in stomatological faculty, for the first time in Ukraine made the orthotropic hepatic transplantation to the patient with decompensated hepatocirrhosis. 2002 Academician V.I. Tsymbalyuk, head at department of neurosurgery, for the first time in the world made the neurotransplantation of embryonic tissue at patients, suffered from cerebral spastic infantile paralysis, apalitic syndrome, epilepsy. 2006 The scientific group, headed by academician V.G. Maydannyk, head at department of pediatrics No 4, for the first time in the world, discovered and described the molecular genetic markers for primary arterial hypertension. 2008 Academician V.F. Moskalenko, rector, head at department of social medicine and health care, for the first time determined the principles on construction of optimal health care system under modern conditions. 2009 Academician Ye.I. Chazov was awarded with the title of honorary doctor of medicine of University in honor of his visit to Alma mater due to the invitation from Scientific council. 2009 Professor I.B. Shchepotin, head at department of oncology, for the first time in the world made the operation on hepatic autotransplantation after removal of malignant tumor in extraperitoneal space. 2010 Academician V.F. Moskalenko for the first time offered the global total complex integral intersectoral interindustry preventive system of vertical and horizontal direction (shortly – global preventive system, GPS). 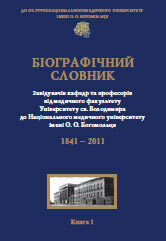 The unique monographic scientific editions, edited by Rector of University, Vice-president of NAMS of Ukraine, academician of NAMS of Ukraine, Professor V.F. Moskalenko, were prepared and published in honor of 170th anniversary of O.O. Bogomolets National medical university for the first time. The books were published thanks to the charitable contributions from many employees of the University. The edition presents the works and milestones of difficult life of the graduate from medical faculty at St. Volodymyr University hierarch Luka (Professor Valentyn Feliksovych Voyno-Yasentskyy), scientist-surgeon and real pastor at the same time. The main milestones of life, scientific, pedagogical and public activity of Volodymyr Afanasyevych Karavayev, famous surgeon, founder and the first dean at medical faculty of Kyiv St. Volodymyr University are described. The monograph is devoted to the parallels of medicine in life and creativity of famous writer-doctor M.A. 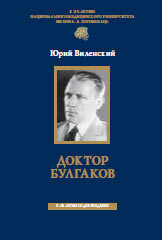 Bulgakov. His medical biography is recreated. The illustrative series of the work on the basis of previous and new sources significantly enlarges the view about the character of the book. 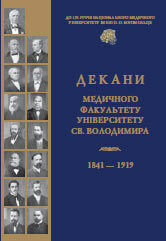 15 biographical essays about activity of the deans at medical faculty of St. Volodymyr University that falls mainly to the second half of XIX century until accepted chronological limit at the end of 1919. The dictionary is the forth, updated, complete edition in 2 books; acquaints the readers with the biographical essays about scientific and pedagogical activity of the scientists from medical faculty at St. Volodymyr University up to O.O. 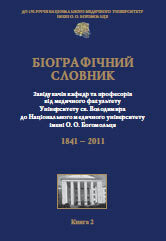 Bogomolets National medical university (1841-2011): Book 1 (1841-1919) – 92 essays, 74 photos, approximately 600 researches of scientists, 127 literature sources, and Book 2 (1921-2011) 428 essays, 375 photos, the biography is added with bibliography, which includes approximately 2,200 researches of scientists, over 300 literature sources about them.